Did you know the De Young and Legion of Honor Museums in San Francisco have Access Days? These occur on one or two Mondays during their temporary exhibitions. The entrance and guided tours are reserved for those who would benefit from visual, hearing, or mobility accommodations. Do you want to plan a group trip for your staff, clients, or organization members? This is just one example of many local trip destinations. BORP vehicles are accessible, which makes it possible for your entire group to travel together to destinations that would be difficult to reach with basic public transport. We seek opportunities to serve more organizations in our community! If you are interested in planning a group trip and want information on how a BORP bus could help with your transportation needs, contact BORP Transportation Coordinator, Sarah-Dawn Smith, at transportation@borp.org or call (510) 849-4663 x 1378 or MOBILE (949) 205-9058. BORP’s accessible group trip transportation service is made possible by funding from Alameda County Transportation Commission through the Special Transportation Program for Seniors and People with Disabilities (Measure B funds). This service is aimed at improving the mobility of people with disabilities and increasing access to sports and recreation activities by supplementing conventional fixed route service and addressing the current gap in accessible group trip options for youth and adults with disabilities in Alameda County. More information about this project can be found on our website and at alamedaactc.org. This week’s fires in the North Bay have impacted the entire Bay Area, including the BORP Community. We were deeply saddened to learn that Christina Hanson was a victim of the fire in Santa Rosa and send our condolences to her friends and family. 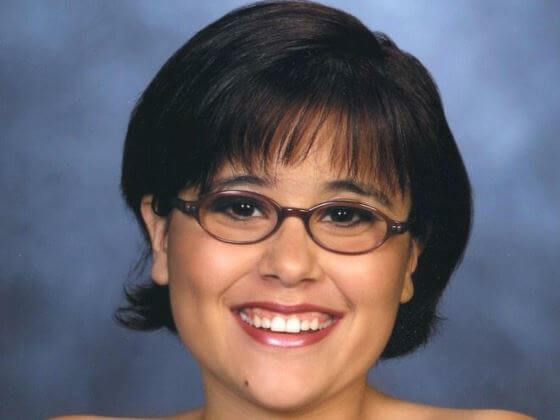 Christina was a BORP youth program participant from 2002 to 2006 — Click here to read a touching tribute to Christina from childhood friend and former BORP teammate, Christine Burke. We have been in contact with many BORP participants who have been displaced as a result of the fires to ensure they have everything they need. All those impacted are invited to join a Facebook group we’ve set up to connect the BORP community with resources, temporary housing, and to meet other needs as they emerge. BORP has hosted the annual Revolution Ride & Festival in Sonoma for 15 years and each year the community opens its arms to help us organize this important event, with local businesses and groups donating everything from coffee and bagels to pop-up tents and water coolers. We are deeply indebted to the region now devastated by fires. 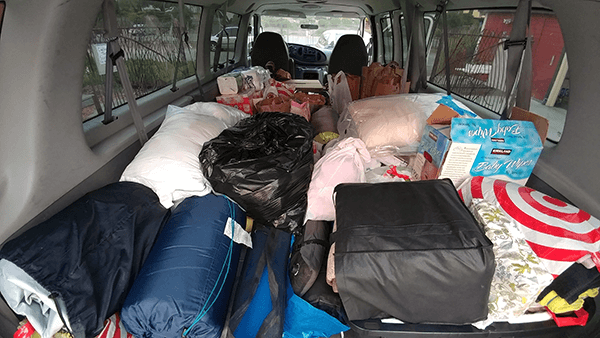 We reached out this week to ask the BORP community to donate supplies for shelters serving evacuees and you responded generously and selflessly, bringing enough bedding, air mattresses, toiletries, water, and other items to fill the large BORP van. We delivered those items on Thursday morning to a distribution center in Benicia, CA and from there they will be sent to shelters across the region based on their needs. When one distribution center volunteer saw the van full of supplies, she exclaimed: “You all are amazing.” We couldn’t agree more. Thank you to everyone who donated goods. Van full of donated supplies for victims of North Bay fires. Perched on the upper south slope of Mt. Tamalpais is the historic West Point Inn; a magical getaway close to the San Francisco/Bay Area. Built in 1904 as a stopover and restaurant on the Mill Valley/Mt. Tamalpais Railway line, this rustic inn sits above the fog belt offering stunning panoramic views of the East Bay, San Francisco, the Marin Headlands and one tower of the Golden Gate Bridge. At night stars fill the skies. Rustic and accessible don’t often go hand in hand but this gem of an Inn is one exception with the caveat that the one-mile dirt road to reach the cabin may be problematic for some lowered floor vans due to road erosion; driving slowly helps. 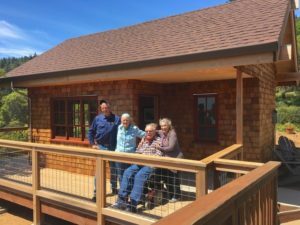 The Emig Cabin, a purposefully built accessible cabin (the other cabin and Inn rooms are not accessible) was built summer 2017 and features a private bathroom with a roll-in shower, a double and twin bed, and a small porch. Reclaimed wood paneled walls from Marin Municipal Water District’s water towers enhance the rooms rustic charm. Unlike the other cabins or guest rooms at the Inn, the Emig cabin has electricity, heat, and hot water. There is an accessible path of travel connecting the Emig cabin to the Inn and van accessible parking—the Inn is hike-in only unless you have a disabled parking placard. Other features of the Inn, all of them accessible, include a community kitchen, dining area, large living room and a spacious deck with expansive views. Guests will need to bring their own bedding and food; there is none on-site or nearby. Escape to this special place and you will likely not want to leave but to continue the magic, from the inn you can drive a short distance to the top of Mt. Tam and hike the wheelchair accessible Verna Dunshee loop trail. It’s best to make reservations by calling the innkeeper, 415-388-9955. Rates for non-members are $50 per person and require a two-person minimum per-cabin / per-night. 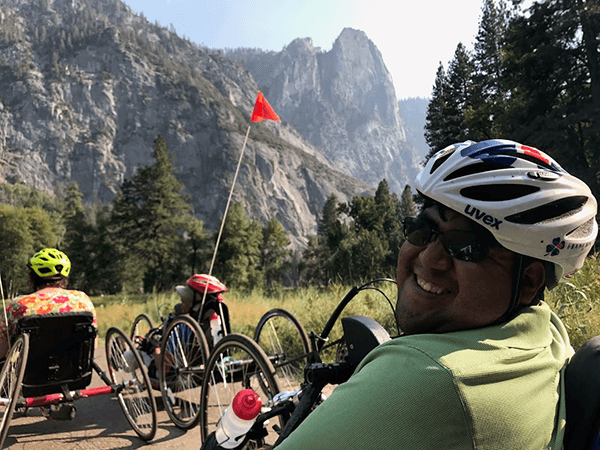 BORP’s Cycling Program and ten BORP Participants joined Mark Wellman’s No Limits Yosemite Adventure in September. For five participants, this was their first time in Yosemite! Oscar Matias is all smiles on his first visit to Yosemite despite growing up in Oakland. Mark was the first paraplegic to climb El Capitan and Half Dome and was a former park ranger in Yosemite. 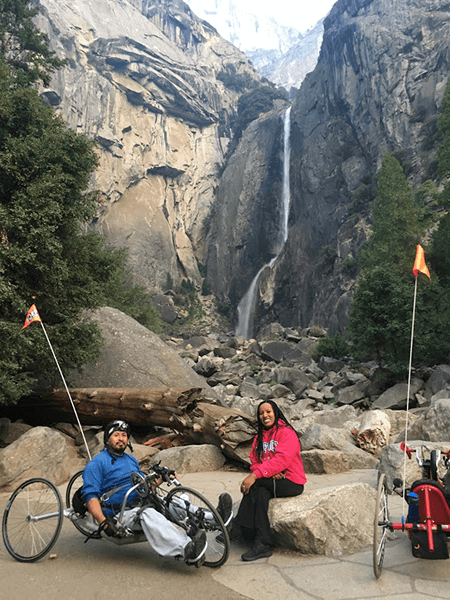 BORP provided the adaptive cycles and leadership of multiple rides around the Valley to Mirror Lake, Yosemite Falls, and El Capitan. We all stayed in the accessible cabins at the “housekeeping camp”, ate group meals that might have been better than what was being served at The Majestic Yosemite Hotel across the river. 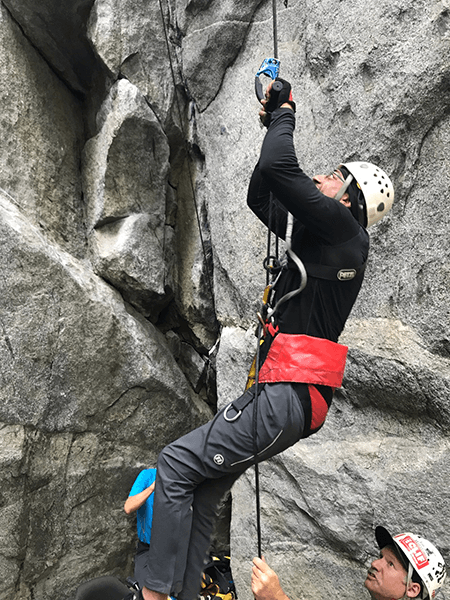 Mark’s adaptive climbing equipment made it possible for all 10 people to get on the rope and climb first to a hanging “ledge” and then beyond to over 60 feet off the ground. 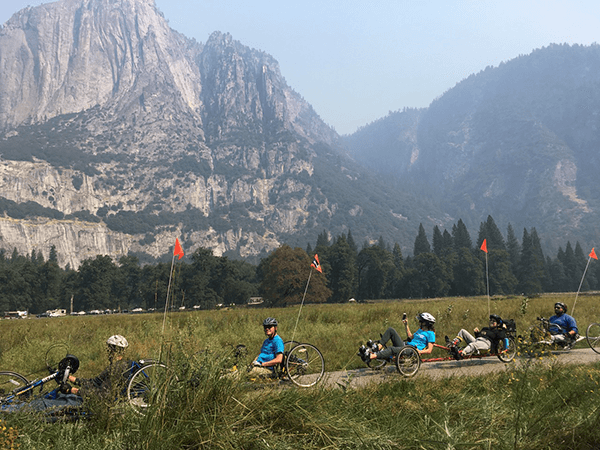 We look forward to working with No Limits and sending another group of BORP participants to Yosemite next year. The trip was funded by the Yosemite Conservancy to help bring underrepresented populations to the park. Dan, Jethro, Marissa, and Jorge cruise the Valley Meadows. 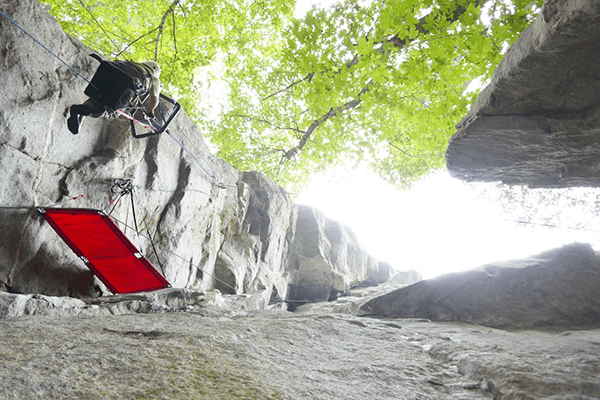 Oscar nears the top of the 60 foot climb. Jorge and Abeba take a break at Yosemite Falls. 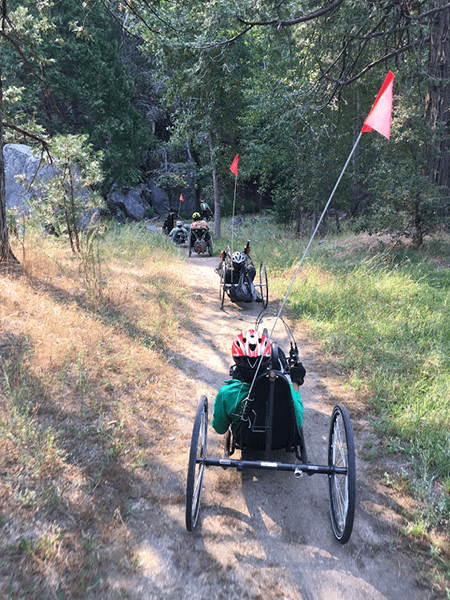 BORP Cyclists take to the trails in Yosemite. BORP Cyclist Abdullah starts his climb up the wall. On October 9th former BORP Bay Cruiser, Christina Hanson, tragically lost her life in the wildfires that devastated Wine Country. Christina’s family has lost a daughter, the disability community has lost one of their own, and on a personal note, I have lost a childhood friend. Growing up, my parents often talked about our summer playdates at the pool and get-togethers at the Spina Bifida Association’s picnic events. As we got older, I fondly recall trips to Christina’s house where we couldn’t wait to start on our latest art project venture, all of course while being serenaded by the greatest Canadian pop diva of all time, Celine Dion. Aside from seeing Christina at Saturday basketball practices, we also found ourselves attending many of the same sports camps. Christina brought a sweet presence wherever she went; my heart truly breaks for her father Michael, whose love for his daughter was a force to be reckoned with, and stepmother Jennifer, who was a fierce advocate and warrior for Christina. Rest peacefully, you are loved and will be greatly missed. A memorial fund has been set up for Christina’s family. Click here to donate.